Whether you're in Arizona for a Cactus League Spring Training baseball game or for your usual spring break getaway in 2019, we're here to give you great ideas about how to spend your vacation! And if you're a native Arizonan and you want to explore a little while the weather's perfect, plan ahead for some of these fun road trip ideas! 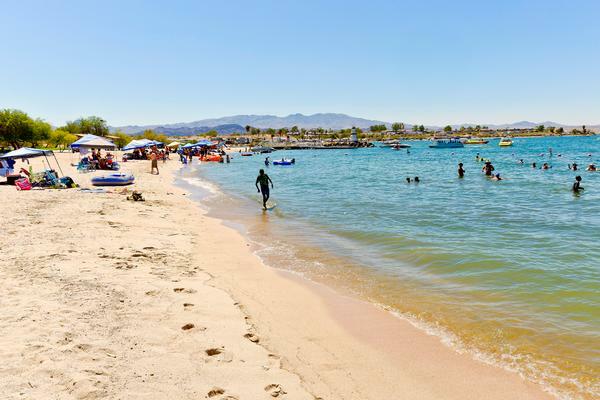 Lake Havasu State Park is known as a destination for spring breakers, but there are three other parks along the Colorado River that offer the same amazing boating, jet-skiing, beach-front relaxing and springtime exploring. Check out Cattail Cove State Park, just 25 minutes downriver from Lake Havasu's beaches. Cattail Cove has a white sand beach, plenty of camping and RV spots, and great hiking trails to keep you happy and relaxed during your spring break. If you head farther south to Parker, you'll reach both Buckskin Mountain and River Island state parks, both set right along the river and offering beautiful campsites, picnic areas, and boat launches. Jump on your jet-ski, paddleboard, or tube float, and bask under the Arizona sun! Inland but still in the western part of the state sits Alamo Lake State Park, a great destination for fishing, camping, and off-highway vehicle use. Nestled in a hidden valley, this lake park offers great stargazing, the best bass fishing in the state, and the quiet for a perfect relaxing break. With camping cabins and a sea of wildflowers, Alamo Lake can make your spring break dreams come true. Visitors in Arizona for the annual tradition of spring training baseball may want to spend a couple hours to head north and check out what else makes Arizona famous. There are five parks you can visit during your trip to Sedona, and one of them offers campsites and camping cabins if you want to extend your stay and make a campsite home base. For your first stop, hop in the car and head to Fort Verde State Historic Park for a tour of the best-preserved fort from the Indian Wars period in the state. This historic destination showcases officer's quarters, doctor and surgeon quarters, bachelor quarters, and exhibits from the 1800s. Plus, enjoy sweeping views of Camp Verde. After your tour of the Fort, spend about 40 minutes driving to the artist town of Jerome. Before heading up the hill to eat, stroll through galleries, or shop on Jerome's scenic streets, stop in at Jerome State Historic Park, housed in the Douglas Mansion. This museum is a trip back in time to Jerome's mining-town past, with touchable exhibits and examples of life in 1916. Just 20 minutes from Jerome is Dead Horse Ranch State Park, located in Cottonwood. 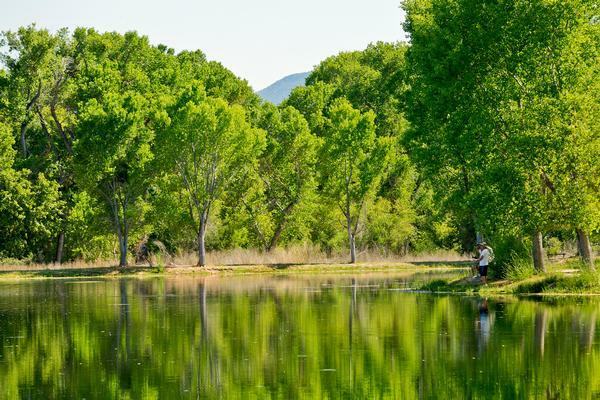 This lush park has two lagoons, tall cottonwood trees, and the flowing Verde River. Bring your kayak or canoe, set up your tent, and settle in before exploring the next two parks! If you decide to camp, you can spend all the time you need relaxing and enjoying the park while expanding your adventure. To truly experience the hues of the mountain ranges in Sedona, visit Red Rock and Slide Rock state parks. Hike the numerous trails through the woods and along the creek at Red Rock for incredible views of Sedona, then head 30 minutes north to cool off with a dip in Oak Creek at Slide Rock! After the great rainfall Arizona got during fall and winter, state parks in the southern region will be awash in their famous wildflower blooms! Springtime weather is great for hiking before the heat of summer sets in, and the sights are impossible to beat! 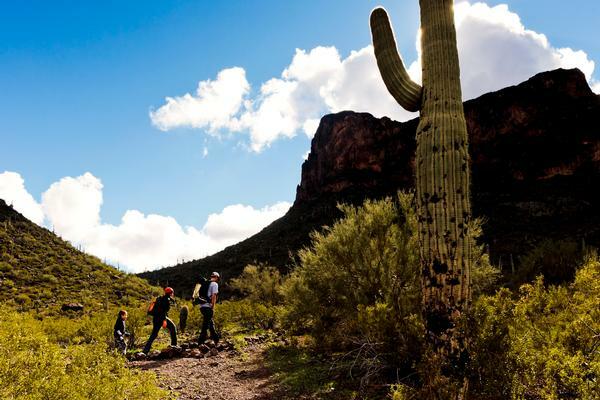 Stick close to Phoenix at Lost Dutchman State Park in Apache Ju nction, a well-known spot and your key to exploring the Superstition Mountains. Set up for some camping or stay in one of the new cabins at the park, and hike trails like the moderate Treasure Loop, or summon up your determination and hike the more difficult Siphon Draw to Flat Iron. Picacho Peak State Park, 90 minutes south of Phoenix and just 30 minutes outside of Tucson, can be your first stop on the way through your adventure! Picacho Peak's campgrounds give you a home at the base of the iconic peak, with hiking and views stretching across the vast desert landscapes. And just 30 minutes southeast of Picacho in Tucson, you'll find Catalina State Park, an incredible experience along the Catalina Mountains. Catalina's trails will lead you to beautiful creeks and waterfalls you never expected in the heart of the Sonoran Desert. If you prefer, you can set up your campsite here and call this park home for the week with easy access to new adventures! From one of these camping parks, take a day trip to Oracle State Park, only 35 minutes from Catalina. This park not only offers access to the 800-mile Arizona Trail, but has its own network of trails great for biking or hiking. Plus, this park is designated as an International Dark Sky Park, so stay after dark for a star party and view the night sky like never before. Starting in February and usually lasting through March (depending on the weather), bright wildflowers bloom across these four southern parks, lighting up the desert with incredible color! For your spring break adventure in southern Arizona, look no further than Patagonia Lake State Park! This hidden gem of the state boasts a gorgeous lake with boat-in campsites, white sand beach, brand new camping cabins, RV and tent sites, boat launch, swimming area, and opportunities for birding, hiking, and exploring. This fantastic destination is close to several day trip quests, like heading to Tombstone Courthouse, Tubac Presidio, and adjacent Sonoita Creek Natural Area. 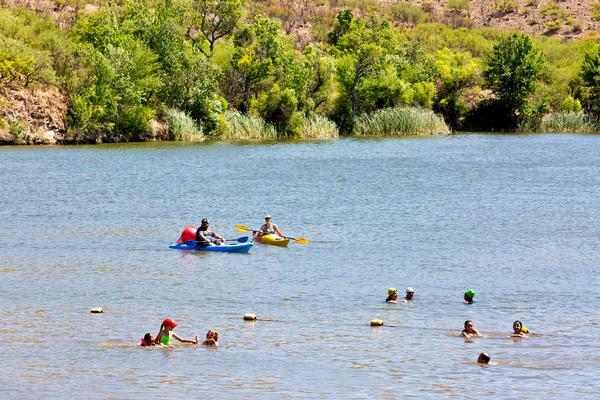 You can head to southeastern Arizona and visit both Roper Lake and Dankworth Pond state parks, where there is something to do for every spring break type! Nearby Mount Graham offers great hiking trails with an abundance of wildlife viewing opportunities, beautiful wildflowers, and the chance for spectacular views. Back at camp, you can take a dip in the cool lake or head out on your boat for the sunset. Cozy camping cabins offer lakeside views, and you can catch your dinner if fishing is your style. Visit our parks and experience it for yourself in incredible Arizona for spring break 2019!